How bad will the surge be on St. Patrick's Day? why in the world wouldn't you report the puke?! Mom of 4 posting on sons phone. I did end up with the Promotion but it was close. It was busy but Uber sent me 7 request 15 to 25 min away 9 or more miles. I didn't accept those as some were not even surged. I declined 2 pool rides until my last trip as it was 3:35. 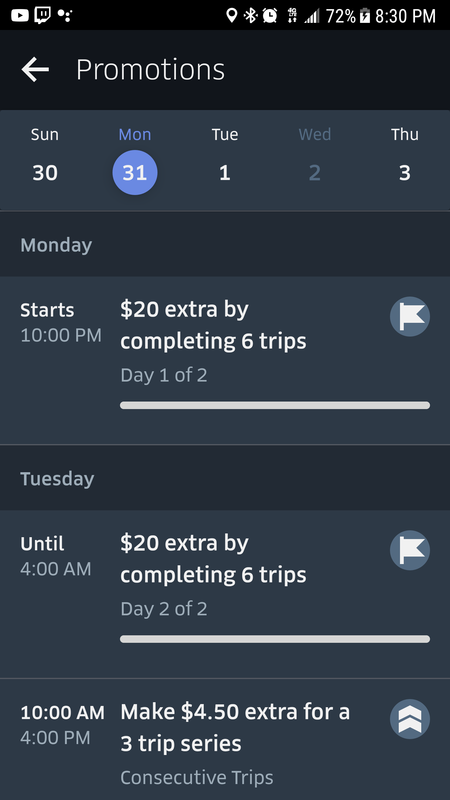 Uber added a second rider with no notification sent that they were adding another rider. Plenty of surges last night but nothing more than 18.00. 9 of 17 rides were surged. Without the surge, promotion, and tips my pay would've been awful. Only 3 trips were over 20.00. All my trips were short ones and traffic in City was awful. I got out as quick as possible. Thankfully I only ended up down there 2X. Had a problem with 2 trips I cancelled because those people made me wait. If you can't have the courtesy to text or call after 7 min I am out of there. I don't understand people. It's all about them, too inconsiderate to realize they are wasting drivers time and costing them money. They don't give a damn. Lots of accidents last night. Would be nice if pay was like that every night. It did then out to be a profitable night with low mileage. Hope everyone has a good night. Happy New Year. They're trying entice people to do shorties rather than the profitable long runs. Regardless, when you have 90% of the active drivers in your city driving, hitting that 6 hr quest isn't going to be as easy as people imagine it will be. 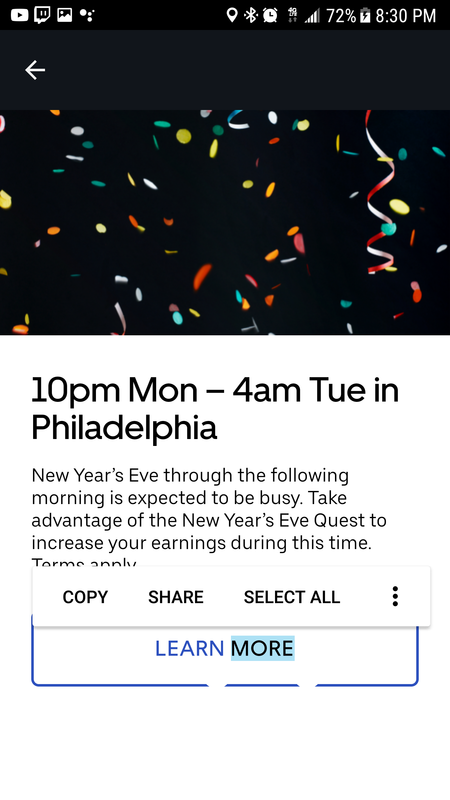 If they put out a 10 rides in 6 hrs quest and oversaturate the market with drivers, many/most will NOT finish it in time, so it costs them near nothing and prevents surge. In the end they have a lot more drivers driving at much lower rates, the passengers are happy and it was all subsidized by drivers who gave up their holiday to subsidize the profit margins of the rideshare companies. From what I hear, many of the drivers who gave up their holiday didn't make much more than they do on any other night of the year. Sadly, few will learn from this experience, and Uber/Lyft will refine the process next year to further maximize their bottom line at the expese of drivers. Nope. Not working tonight. Weather is horrible, cant count on big surges like in the previous years. Staying in and staying warm.